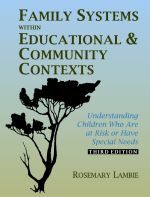 The third edition emphasizes at-risk children and those with special needs, and it includes a new chapter on violence and bullying in schools and communities. Every chapter has been extensively updated to reflect current literature and thinking. The content provides a wider systemic view of how professionals and family members can better serve children who are at risk for failure in school or in life. This book explains major concepts and research findings on the family life cycle, family interactions, and other environmental factors that may affect children. It examines special populations, including families of divorce and remarriage as well as abusive or addictive families, and it provides specific strategies for working with these special children and their families. The applications section includes strategies, concrete exercises, and interventions. 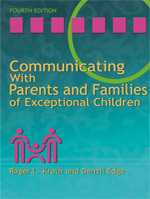 This book combines innovative strategies with daily activities designed to improve communication between the school and families of special needs children. The text addresses the changing family structure and takes the stance that parents and educators should be partners rather that combatants. Listening skills and positive communication are the heart of building positive relationships between family memebers and professionals. This text explains how to handle parent–teacher conferences, progress reports, group meetings, parent training, and planning programs. This fourth edition takes an in-depth look at fostering the best relationship between teachers and parents. Classroom teachers, as well as special educators, will find this resource extremely useful in communicating with parents and addressing the needs of children with disabilities. Teaching SocialEmotional Skills at School and Home is designed to provide teachers and parents with strategies for teaching children and youth to become socially and emotionally competent. This book is research-based yet practical and easy to read. 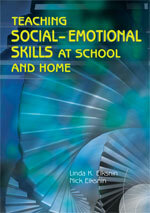 The authors examine all aspects of socialemotional learning, including emotional literacy, social problem solving, and the social skills essential for making friends and succeeding in schoolmaking this text the most comprehensive available. Readers will learn how to teach socialemotional skills at the individual, classroom, schoolwide, and districtwide levels by integrating instruction within the academic curriculum and how to make socialemotional learning part of school and family life.